Dangerous house fires happen far more often than most people realize. In fact, house fires are the fourth leading unintentional cause of injury and death in the United States among people of all ages, the third leading cause for children younger than one-year-old, and the second leading cause for children between the ages of one and nine years old. According to data from the National Fire Protection Association (NFPA), there were 365,500 house fires in 2015 alone, which resulted in more than 11,000 injuries, nearly 3,000 deaths and property damage costs of $7 billion. After a house fire, many people are forced to go through the painful, emotionally draining, and financially devastating process of rebuilding their lives from scratch. The financial burden of such an undertaking cannot be overstated. However, people who were injured or suffered property damage in a house fire caused by a defective product may be eligible for compensation. Regardless of what they make, manufacturers are required to ensure that their products are not needlessly hazardous for consumers. Manufacturers who fail to ensure the safety of their products can put consumers at risk for serious accidents, including house fires. When it comes to products that can malfunction and cause dangerous house fires, appliances—both large and small—are a common culprit. In fact, according to data from the Consumer Product Safety Commission (CPSC), major appliances such as dishwashers, refrigerators, and microwaves caused more than 150,000 residential fires each year between 2006 and 2008. That is not all—these house fires were also responsible for 150 deaths, more than 3,600 injuries, and $547 million in property damage. Other products commonly associated with fire risks include clothes dryers, toasters, and space heaters. What causes appliances and other products to start fires? Sometimes the products feature a defect in the design that makes them inherently dangerous. Other times, the defect occurs during the manufacturing process—when the product is assembled improperly or using low-quality materials. In other cases, products may lack labels that warn consumers of fire risks. Install smoke detectors and check them at least twice a year. Functional smoke alarms can reduce fire fatality risks by up to 50 percent. Keep all matches, lighters, and flammable liquids out of the reach of children. Safely extinguish cigarettes and candles. Maintain appliances and electronics. Replace those that regularly overheat or have frayed cords with wires exposed. Avoid overloading electrical outlets and extension cords. Keep furniture and other items at least three feet from heating sources. Regularly clean your chimney and clothes dryer vents. Was Your House Fire Caused by a Defective Product? 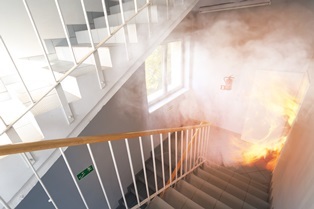 If you sustained injuries and property damage in a house fire that was caused by a defective product, you may be eligible to file a personal injury lawsuit and seek compensation from the product's manufacturer. Personal injury attorneys with experience handling product liability cases can help you fight for the financial recovery you need to start over after a serious house fire. Contact the Morris James Personal Injury Group today to schedule a free initial analysis of your case.